Brussels sprouts are uber healthy. They have been linked to cancer protection, lowering cholesterol and supporting thyroid function, and they taste superb. I like my Brussels sprouts roasted until they are a tad bit past bright green and the bitterness has been reduced leaving a hint of sweetness from the caramelization that is happening. When paired with onions and bacon you've got a substantial side dish. Start by cleaning the Brussels sprouts. First cut off any discoloration on the stem. 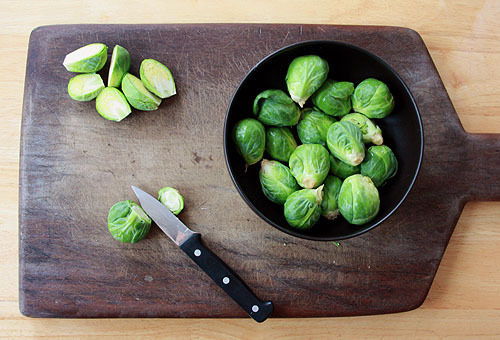 If the Brussels sprouts are larger than a ping pong ball you'll want to cut them in half so they cook all the way through. Then dice the onion. We don't eat a lot of meat, but we do usually have some bacon in the freezer. We slice off what we want with a sharp knife and then put the block back in the freezer. It's a handy little trick. 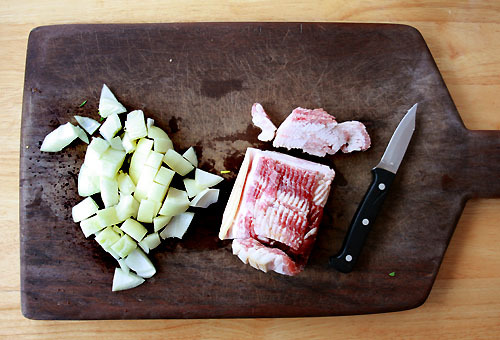 In a large skillet, saute the bacon and onion together over medium heat until the onion starts to brown. Then add in the Brussels sprouts. Cover and stir every couple of minutes until the Brussels sprouts turn bright green and then start to fade to a more avocado color. You're want some browning and caramelization happening. 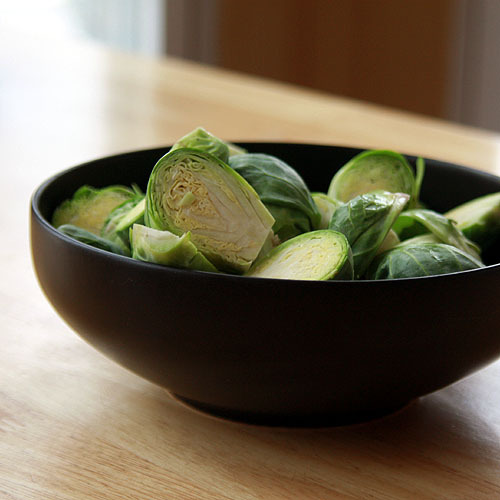 Turn the heat off and allow the Brussels sprouts to sit covered, while you prepare the rest of your meal. They are best if they get five minutes or so to steam before serving. We enjoy Brussels sprouts with grilled fish or as a side to eggy-in-a-basket. Hop on over to An Austin Home Stead where I wrote the recipe as a guest post! If you found your way here from An Austin Homestead, I hope you'll stay awhile. There is a button over on the left to subscribe or become a facebook fan. 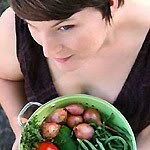 I've got a lot of recipes and garden ideas to share. Everyone should eat this for a healthy living. lets me share it to other people. I have wanted a recipe to try this and now I have one! Thank you so much! These look so good, and I want to make these soon. i will use TJ's uncured turkey bacon, s good, and healthier than regular bacon. Great combination! Gonna try your recipe soon! I love brussel sprouts with pancetta... yum! Your photos are beautiful too! I love brussel sprouts .... and I love love love this recipe! What a great, delicious way to dress up those tiny cabbages! Great job! Brussels sprouts rock! and this recipe sounds easy and delish. Try adding small red potatoes to the mix and drizzling with lemon butter as a finish, it makes this a one-pan meal. A healthy side dish indeed. I might confess I rarely cook Brussels sprouts but I keep bumping into them in all the restaurants. 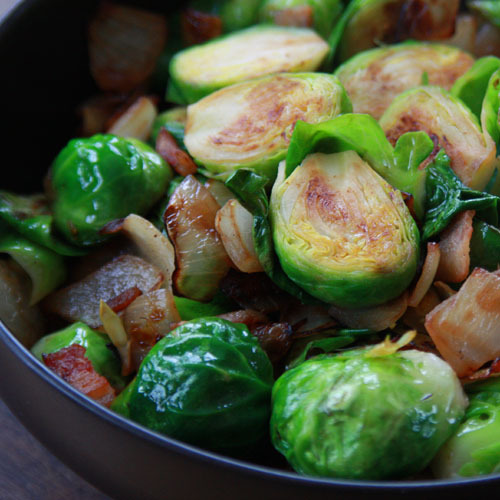 I am an unashamed fan of brussels sprouts and this is one of our fav ways to cook them too. Never knew the exact health benefits though, thanks and gorgeous blog! Bacon makes everything better! I like to make something similar to this and everyone eats it, even the teen! Your photos look great! I like your description by color; waiting for the more avocado color. That's perfect. 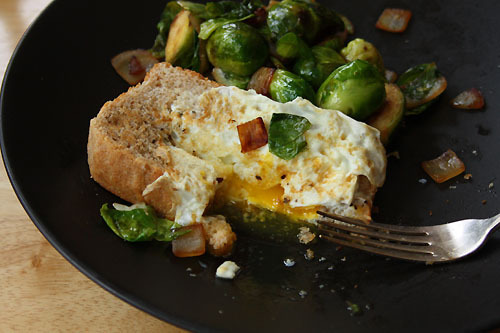 With the egg-in-the-hole (as we call it), it's breakfast, my favorite meal! I love it.